Our volunteer opportunities at ILI Travel include working with nonprofits in the Dominican Republic to provide the support that locals need. This trip will pay fair trade wages and create jobs in the Dominican Republic, while also focusing on sustainability by staying in locally-owned hotels, eating in locally-owned restaurants, and hiring local transportation companies. We will have a full-time Dominican guide not just to enhance our tours but our evening reflections as well. We focus our Dominican Republic volunteer opportunities on locally identified needs. Unfortunately, there are too many misguided or even unethical examples of service learning in which people arrive with their own agenda. At ILI Travel, we fully understand that we are not a developmental organization. However, we are passionate about partnering with Dominican developmental organizations and youth groups to help them get some of the support they so desperately need. Reflections as a group about our day and what to expect. Reflections will be facilitated by our Dominican Field Director and your team leader. Arrival at the school or community center. During the morning, help with light construction projects (e.g., painting, digging, beautification). Lunch at the school or community center featuring local Dominican food. Some meals include chicken, fresh pineapple and other fruits, rice and beans, and more. Work with the kids in school or summer camp with sports, games, and skills development. Some days, stop at the local supermarket. Dinner at the hotel featuring local Dominican food. Optional: Take out your phone or GoPro and create a video blog! Group reflections to continue building our team and processing the meaning of our trip. Excursion to local beach. We may leave early to avoid the larger crowds. Time to relax at the beach. Dinner out that night to experience some of the local nightlife. Wake up early to take in what you can in your surroundings. Be sure to journal or blog about your experience. Some trips go to Cayo Arena, a gorgeous sandbar in the Dominican Republic. Departure for the United States. A Life Changing Experience for Everyone! Students from PA, NJ, and other areas, have had life-changing experiences on our Dominican trips and Haiti volunteer opportunities. While there have been many activities to support the larger goals of the school or nonprofit, there are also beautiful, individual moments of bonding: piggy back rides, hair braiding, special handshakes, occasional dancing, and lots of laughter. On one occasion, a young girl from Bucks County even cried when leaving the school on the last day, and has been looking for a way to return ever since. After participating in one of our Dominican Republic Volunteer Opportunities, many have never looked at the world the same way again. A high percentage of those who attend budget their money carefully so that they can attend again the following year. They understand that the experience provided is not one that they can easily find on their own when crossing cultures. With our 8-day trip, there are also opportunities to enjoy the natural sites in the Dominican Republic. From natural waterfalls to glorious beaches, there is a lot to see in a culture that values environmental preservation. Some trips allow you to sign-up for extra activities, such as surfing or zip lining. After surfing lessons, one girl noted that she’s had surfboards in her garage her entire life, but her father didn’t surf anymore. She vowed to go surfing with him the weekend he returned. 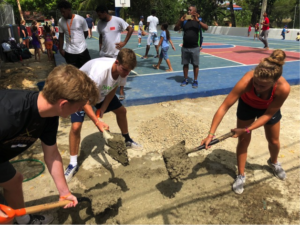 Run One of Our Dominican Republic Volunteer Opportunities! With our service learning program, we work with teachers and schools, colleges and professors, Girl Scouts, non-profit leaders, and many others. For many, visiting a country for service learning proves to be a life changing experience. Service learning abroad opportunities can be planned for groups from Chester County, Burlington County, Bucks County, Essex County, Union County, Warren County, Montgomery County, or elsewhere in PA, NJ, and beyond. Groups and individuals have been camp counselors, taught English, painted and beautified schools, and participated in social justice tours. We have a wide array of exciting options for your group. Contact us to learn more today!